May 03, 2018 "Information Clearing House" - Things are escalating again in one of Syria's many wars. On 29 April, two massive strikes - presumed by Israel - reportedly hit the Syrian Arab Army's 47th Brigade military base and arms depots near Hama, as well as Nayrab Military Airport in Aleppo. The attack appears to have been coordinated with the US, coming just hours after US Secretary of State Mike Pompeo left Jerusalem - where, according to Haaretz, he had "thrilled Netanyahu with hawkish talk on Iran". That same day, noted the Times of Israel, "news also broke of a phone call between Netanyahu and US President Donald Trump", while Israel's defence minister, Avigdor Liberman, was meeting his US counterpart James Mattis in Washington. This feverish activity came less than a week after General Joseph Votel, the head of the US army’s Central Command, or Centcom, whose sphere of responsibility includes Syria and Iran, made "a largely unpublicised visit to Israel." The Times of Israel article concluded: "All this is beginning to look rather like a coordinated Israeli-American operation to limit Iran's military activities in Syria - simultaneously conveying the message to Moscow that Russia's green light for Iran to establish itself militarily in Syria is not acceptable in Jerusalem and Washington." In January 2018, with the battle against Islamic State (IS) almost won, former US secretary of state Rex Tillerson announced new goals for US troops in Syria, vowing that they would remain until "Iranian influence in Syria is diminished, and Syria's neighbours are secure from all threats emanating from Syria." In February the International Crisis Group warned that Israel had "updated its red lines – signalling it would take matters into its own hands if necessary to keep Iran from establishing a permanent military presence in Syria". Two months later, on 9 April, Israeli missiles again struck the same "T4" military base they hit in February. The target was specifically Iranian installations and equipment, and 14 Iranian soldiers were killed. 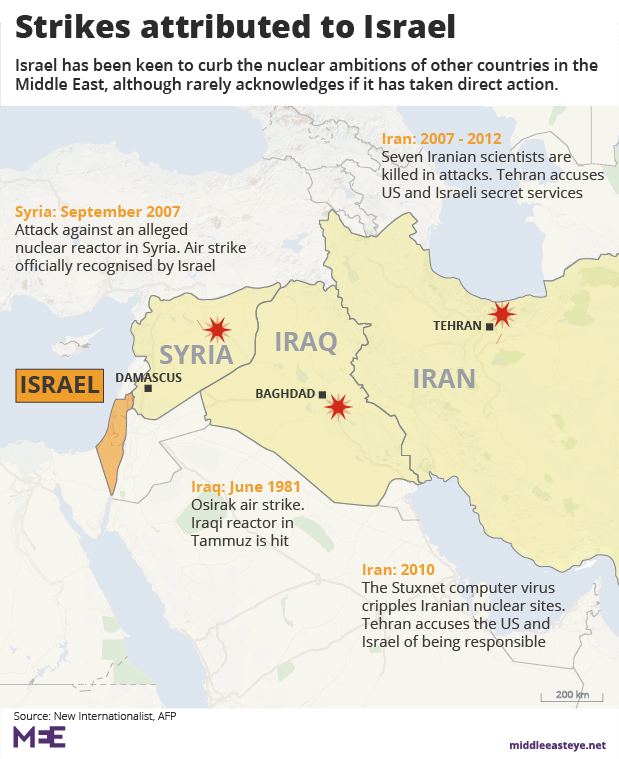 According to one Israeli official, this was the first time Israel had attacked "live Iranian targets". It was also, apparently, the first time Israel had failed to inform Russia to provide advance warning of an upcoming strike, breaking the "de-confliction" agreement made between Israel and Russia right at the start of Russian entry into the Syrian conflict in 2015. Russia's response was similarly unprecedented, with Russia immediately revealing Israel's role in the attack, and Russian President Vladimir Putin calling Netanyahu to warn him that Israel can no longer expect to be able to attack Syria with impunity. Then, following the US-UK-French air strikes on Syria on 13 April, the chief of the Russian General Staff's main operations directorate, Colonel General Sergey Rudskoy, floated the idea of providing Syria with the powerful Russian-made S300 air defence system. The S300, capable of tracking up to 100 targets simultaneously over a range of 200km, "would create a no-go situation for Israel if allowed to be made operational by the Syrian regime", according to former US naval officer Jennifer Dyer, who added that: "The kinds of low-level, preemptive strikes (in Syria) the IAF [Israeli Air Force] has executed in the last few years, against Hezbollah targets and the special weapons targets of Iran and the Assad regime, would become virtually impossible." Media reports, both mainstream and alternative (my own included), are increasingly nervous about the scenario now unfolding, and rightly so. Yet while the danger of escalation and miscalculation - and specifically, the drawing in of Russia into the Israeli-Iranian conflict developing in Syria - remains real, many analysts have overstated the friction between Russia and Israel - and, indeed, the convergence of interests between Russia and Iran. Despite both being opposed to western-backed regime change in Syria, Russian and Iranian objectives in the region are in fact very different. According to intelligence analysts Stratfor: "Russia's strategic vision is chiefly focused on eliminating sources of instability and preventing US-led military interventions", with a "broader goal of establishing itself as an indispensable guarantor of collective security in the Middle East". In Syria, therefore, the Russians have the "limited objective of ensuring that Assad controls enough territory to negotiate with Syrian opposition factions from a position of strength" in order to create a mediated, negotiated settlement, overseen and guaranteed by Russia. The Iranians, however, are more focused on "containing Saudi Arabia's power projection capacity across the Arab world", according to Stratfor analysis, leading to an "unwillingness to suspend military operations in Syria until Assad has completely vanquished opposition forces… Iran's belief in the feasibility of a military solution in Syria has made it less willing than Russia to diplomatically engage with Syrian opposition or Kurdish factions during diplomatic negotiations, limiting the scope of the Moscow-Tehran partnership." Furthermore, "Iran's use of Syrian territory to create a permanent transit point of weaponry to Hezbollah has alarmed Russian policymakers who seek to preserve strong relations with Israel." From this point of view, far from seeking to protect Iranian entrenchment in Syria, Russia has a direct interest in restricting it. Israeli strikes may thus serve a function for Russia, putting pressure on Iran to "rein in" the activities Russia views as disruptive to its own aims. Furthermore, Russia may believe that the Iranian presence in Syria - as an alternative source of support for President Assad - makes the Syrian government itself less willing to sign up to Russia's diplomatic initiatives. Indeed, on a very basic level, a reduced Iranian presence leaves Assad more thoroughly dependent on Russia. And no doubt it is. But what if there is no risk? While the Russian-Iranian alliance remains crucial for Moscow's projection of power into the Middle East, Russia may well calculate that Iran has no interest in jeopardising this, however poorly they are treated by their Russian "ally" in Syria. After all, the provision of protection against a US attack on Iran is hardly a buyer's market - Russia is a monopoly supplier. Safe in the knowledge that Iran really has no-one else to turn to, Russia can afford to let Israel loose on them in Syria. Certainly, Israel's belligerent defence minister does not appear to see Russia as an obstacle to Israeli plans for Syria. "What is important to understand is that the Russians, they are very pragmatic players," he said in Washington recently. "At the end of the day, they are reasonable guys, it’s possible to close deals with them and we understand what is their interest." He certainly doesn't sound like he is referring to a steadfast ally of a state Israel is just about to wage war on. If Russia really is going to allow their erstwhile Iranian comrades to get wiped out, they really should understand that this is not simply a matter of Israel's "legitimate security concerns". This is about eliminating Iran’s chance of building up a deterrent in Syria, in advance of an all-out war against Iran itself. - Dan Glazebrook is a political writer and editor of stopstarvingyemen.org. He is author of Divide and Ruin: The West's Imperial Strategy in an Age of Crisis and blogs at danglazebrook.com.